Bring out your head . . . 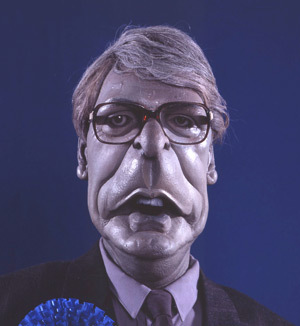 This plasticine self-portrait [it's by Newplast actually] gets another airing, this time without the praying hands I showed it with last year. As ever the show invitation came at short notice, and the other piece from last years end of year show was particularly requested for. I discovered it in pieces in storage and had a very long and stressful Royal Wedding weekend recreating it. I didn't have nearly enough time to include the ears this time. I don't know if I'd advise anyone to show works made in plasticine , a combination of calcium carbonate petroleum jelly and other fats. I grew tired of clay drying before I had finished modelling, and used grey partly as a good mid-tone to work with as well as close to the colour of concrete which I still hope to cast these pieces in. 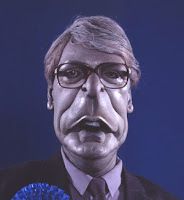 Though of course they are a little reminiscent of Spitting Image's John Major puppet. They are all originally intended as a macquette for a huge bust combining reclaimed wood and cast concrete pieces that will never be realised. I quite like the clamminess of the plasticene mimicing the skin of those under stress, the mood of the work. My interest in the figurative coming from ideas about how we manage identities within the bodies that we are given.